Picking up with the cliffhanger at the end of Volume 1, Ichigo has his hands full as he battles Hollows, the painful memories of his mother’s passing, and a stuffed animal. Rukia is trying to assist Ichigo with his new role as a Soul Reaper, but not every problem can be solved by her years of knowledge with the Soul Society. Ichigo Kurosaki has never led a normal life and, since meeting Rukia, it doesn’t look like he’ll be having one any time in the near future either. 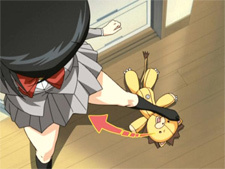 And… wait a second, did I just say Ichigo is battling a stuffed animal!? Viz Media brings us the second volume in the ongoing spirit series with Bleach: Volume 2. Living now as both a high school student and as a Soul Reaper, the last thing Ichigo wants to do is put his friends and family in danger. But evil isn’t that picky when it comes to finding someone to prey upon. Episode five concludes our cruel cliffhanger from Volume 1 with Chad and the parakeet. Rukia takes on the Hollow by herself, but her temporary body isn’t powerful enough to be much of a challenge. Before the Hollow can choke Rukia to death, Chad comes running in and delivers a hard blow, knocking the evil spirit off of her. With Rukia’s ability to see the Hollow and Chad’s brute strength, they manage to keep the monster busy. 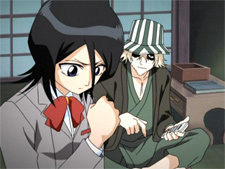 Knowing that Ichigo will arrive soon, Rukia leads the monster away from Chad so that he won’t be in any further danger. 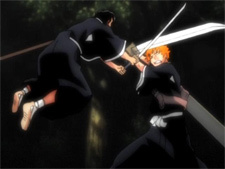 Just when the Hollow thinks he’s cornered Rukia, Ichigo steps in to show what a real Soul Reaper can do. Our next pair of episodes introduce Kisuke Urahara and his specialty shop for all kinds of wants. 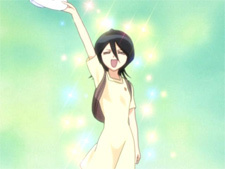 Rukia visits the store to obtain some pills to help restore strength to her temporary body. While there, she also picks up a little gift for Ichigo. Gikongans are substitute soul pills that place a temporary soul into a body so that the other can leave. Rukia knows she may not always be around, so this will help Ichigo separate from his body when the Soul Reaper is needed. Oh, and it comes in a cutesy PEZ-like dispenser shaped like a duck. Ichigo questions the “Soul Pill” dispenser and Rukia complains about how she really wanted the bunny-shaped Chappie instead. Odd revelations aside, Ichigo pops a pill to test it out. The transformation works easily enough, and the substitute soul goes off to attend classes while the other two take care of a mission assignment. Meanwhile, Kisuke Urahara notices that the box which contained the Soul Pill dispenser is marked “defective.” He quickly orders the store employees to prep to capture the defective soul running loose. The gikongan running around as Ichigo is having the time of his life and showing off what amazing abilities he has. It seems that the defective soul dispenser contained a Modified Soul that was supposed to have been destroyed by the Soul Society shortly after its creation. The attention needs of the Mod Soul are fulfilled when fake Ichigo returns to his classroom… through the window… over three stories up from the ground. Rukia and the real Ichigo return from their mission only to find the Mod Soul hitting on the girls, including Ichigo’s friends Tatsuki and Orihime. The Soul Reaper and Mod Soul duke it out in the classroom briefly before the Mod Soul escapes with Ichigo in pursuit. Everyone is stunned at what Ichigo is doing, but Orihime has a feeling that it wasn’t the real Ichigo they just saw destroy the room. Episode seven and eight also start a new multi-episode storyline revolving around the death of Ichigo’s mother. With the Gikongan Mod Soul stuck inside the body of a stuffed animal, Kon has been rendered powerless against everyone who can ignore his cute exterior. Ichigo’s friends are still confused by the events of the previous day, but Tatsuki soon realizes that the anniversary for when Ichigo’s mother died is here. The Kurosaki family makes their annual outting to visit the grave of their mother. Rukia Kuchiki tries to tag along with Ichigo, but he quickly dismisses her and Rukia’s suspicions of a Hollow having killed Ichigo’s mom. Rukia wanders around in the park forest, upset, when she’s confronted by Eikichiro Saidoh of the Soul Society Stealth Force. The Society wants to know why she hasn’t returned. Kon tagged along with Rukia and bolted when the Soul Reaper appeared. He finds Ichigo wallowing in the painful memories of his mother’s death, but he pulls it together when he hears Rukia is is danger. 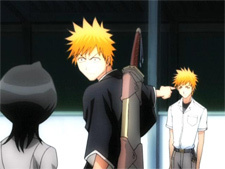 Ichigo confronts Eikichiro when Eikichiro figures out why Rukia hasn’t returned yet. The two start to battle when a Hollow appears and attacks Ichigo’s sisters at their mother’s gravestone. Bleach is already doing better four more episodes into the series. The growing storyline, with the death of Ichigo’s mother and the possibility of the trouble Rukia could be in with having a human substitute Soul Reaper, makes waiting for Volume 3 very hard. The Bleach cast continues to do well on the Japanese side, with Fumiko Orikasa’s Rukia Kuchiki being fleshed out a bit more in presentation and use in the series. Studiopolis, on the other hand, continues to make a mixture of good and bad decisions. The changes in the script are becoming a bit more noticeable, although it’s nothing that affects the overall series yet. There is still lots of room for improvement as this series continues on. On a happier note, Michelle Ruff flexes some of her acting muscles in this volume as Rukia becomes more expressive with each passing episode. I’m looking forward to seeing how this continues to develop in the next volume. Bleach: Volume 2 is a vast improvement in garnering my interest in the entire series. If you were only so-so about the first few episodes, do yourself a favor and give the series a second chance with this volume. The hardsub sign-translations continue to pop up on and off for different items, but not as prevalent as in the previous volume. Other than one noticeable misspelled word, the subtitle track continues to be pretty good. Viz has again added the bonus of a sticker page with the volume’s DVD cover and the episode slates. It’s something nice to have around, although I’d want two copies so I could have one to use and one to keep with the DVD. Bleach is quickly growing on me and will be a strong series to contend with in the coming years. The addition of Kon, the growing of Rukia, and the fleshing out of Ichigo make this a good show to keep up with. If you haven’t had a chance yet, go grab the first two volumes of Bleach and see if you can resist wanting Volume 3 already.